Physical characteristics: Common mynas are stocky, brown birds with a glossy black head and throat; yellow bill; bare yellow skin behind the eyes; and yellow legs. 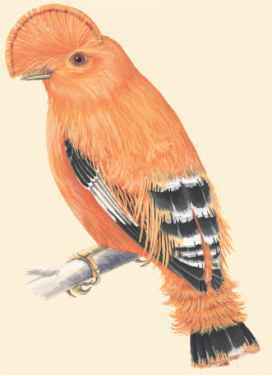 Females and males are familiar in appearance, while juveniles are duller in colors. Adults are 9.1 to 9.8 inches (23 to 25 centimeters) long and weigh between 2.9 and 5.0 ounces (82 and 143 grams). Geographic range: They are found in lowlands and to elevations of 4,500 feet (1,370 meters) in southern Asia from southeastern Iran though Afghanistan, Pakistan, India, Sri Lanka, southern China, and Vietnam. They have been introduced in Arabia (the peninsula in far southwestern Asia), South Africa, Madagascar, Australia, New Zealand, Fiji, Cook Islands, Society Islands, Hivaoa in the Marquesas Islands, and Hawaii. Habitat: Common mynas inhabit open habitats such as farmlands and cities. Diet: Their diet consists of insects, small vertebrates (animals with backbone), carrion (decaying animals), fruits, grains, and occasionally on eggs and the nestlings (young bird unable to leave nest) of other birds. They feed mostly on the ground. Behavior and reproduction: Common mynas are tame, bold, and noisy birds; usually seen in pairs or small flocks. They build bulky nests in tree cavities, pockets in buildings, and in heavy vegetation. Females lay four to five glossy, pale blue eggs. The incubation period is thirteen to eighteen days. Both parents incubate the eggs. The nestlings may leave the nest at around twenty-two days or longer, but may still not be able to fly for another seven days or so. Common mynas and people: Common mynas are considered a pest in Australia where thousands of noisy birds roost near populated areas. They are also considered a pest when they eat grain or fruit from agricultural lands.